In these days with a mobile phone, one can shoot High definition videos or even 4K videos without any knowledge. Funny clips from your family adventure to crazy shots of sports action can easily shoot without any effort. But are you a budding filmmaker or want to do more with videos, do you want to shoot stunning 4K videos? Then definitely yo need an advanced camcorder. Here are the right gadgets to deliver impressive performance. Camcorders are the portable device that can records both video and audio onto a storage device (like, solid state flash memory cards, DVDs or to an inbuilt hard drive). Camcorders offer advanced features and manual controls like manual focus, manual exposure settings, and microphone input settings. It can also capture still images like an ordinary point and shoot digital camera. You have to check the sensor features and resolution, ability to adjust focus manually or automatically, optical zoom (20X, 50X), manual exposure settings (if needed), in camera effects, microphone sensitivity and technology (like, Dolby digital), external microphone or headset supports, Variangle display, connectivity (NFC,WiFi), supported recording mediums and type of memory cards supported, recording formats available (so you can edit with your favorite video editing program) and last but not the least image stabilization and correction, as your capturing the visuals in handheld mode. Almost all camcorders have a flip-out LCD screen, optical zoom, and autofocusing ability, and other common features are available while other features like external microphone support, built-in light, are less common. The largest image sensors on consumer camcorders are now becoming 1-inch. The larger the sensor is, the more fine detail can be recorded. Besides that, a camcorder with a larger sensor will have better light gathering ability and low light performance. Image Stabilization technology reduces the blurry video that you could get in using a zoom lens when walking, traveling or riding. Auto-focus adjusts the camera itself to get maximum sharpness. Some camcorders have a manual-focus ring that can be helpful in some situations like low light conditions. You can adjust the zoom using your finger by pressing it one way to zoom in and the other to widen the view. Optical zoom and digital zoom are available. An optical zoom is a true lens zoom and produces much better-quality images, while digital zoom is an in-camera image processing technology. Optical zoom uses the lens optics of the camera to bring the subject closer usually represent as 20X, 50X, etc. Check the camcorder specification to find the optical zoom range (usually between 10x optical zoom to 50x optical zoom). The digital zoom is achieved by cropping and enlarging the image once it has been captured by the camera’s sensor. Check how accurately the built-in microphone can record the audio. Most advanced camcorders can record sound without noise or hiss. Some camcorders are equipped with wind noise cancellation feature. Most advanced camcorders have a jack to use an external microphone. New technologies allow you to wirelessly transfer photos and video to your computer. You can instantly backup them up on your hard-drive, or can directly upload them to popular social networking websites. New models allow you to wirelessly connect and transfer video and photos to your smartphone or mobile devices and to control the camcorder remotely from an app on a smartphone or tablet. If you are a traveler, this will be a must feature. A rugged and waterproof camcorder is good to resist moisture and rain. There is a new type twin camera camcorder has a wide-angle camera is built-in to the LCD door that can be used for picture in picture video (Panasonic HC-WXF991K 4K Ultra HD Twin Camera camcorder). Another type of camcorders has built-in projectors on their LCD door, which projects the video onto a wall or screen, up to 100 inches diagonal (Sony PJ line camcorders). Some camcorders can capture 3D photos or 3D video, or both. Also consider factors like bitrates, aperture if needed. Higher bit rates mean better video quality results in large files. When using higher bit rates, your memory card will fill up much faster than a low bit rate video. The aperture means, the size of the opening in the lens that allows light to enter into your camcorder. The larger the opening, the more light will enter resulted in better low light videos. The aperture is usually indicated in f-stops. The smaller numbers mean bigger apertures. For example, an f1.8 aperture is excellent for low light videos. If you need better quality audio, use camcorders having external Mic jack support to use an external microphone. In this section, camcorders meant for amateur applications like family vacations and capturing events. Even the title says it as basic, but have some advanced features too. Most of this type camcorders have a 20x or more optical zoom with an advanced lens system, high dynamic range (popularly known as, HDR) video capturing capability, Back Side Illumination (BSI) sensor to suppresses noise, and in the video part, Full-HD (1080p) videos with slow motion video capture abilities. WiFi and NFC may be included in these type of cameras to instantly connect to your phone and broadcast events in real time. You can control the camcorder from your mobile phone, so you don’t need someone’s help to capture your own adventures! You can expect a bunch of creative filters and effects in these cameras. You can expect a good quality sound recording. Some cameras (like Panasonic) supports 5-Axis hybrid optical image stabilization, that offers the five-axis correction to suppress blurring in videos. The level shot function automatically detects and corrects tilting of captured images. The old standard definition camcorders were now replaced by high definition camcorders (HD). Most budget camcorders can record high-definition video (at either 1280 x 720 pixels or 1920 x 1080 pixels at various frame rates). These videos look best when viewed on your HDTV. 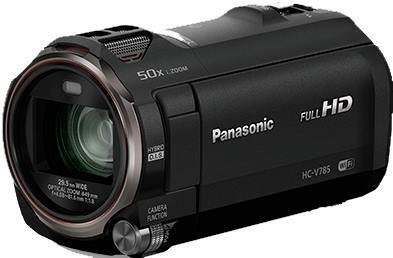 Full HD camcorders have a 1080p resolution and HD camcorders have a lower quality 720p resolution. These are a new range of camcorders, with 4K recording capability. A 4k camcorder offers the 4K resolution (3840 x 2160 pixels), that is four times the resolution of a full high-definition (1920 x 1080 pixels) camcorder. These cameras can produce fantastic, clear, sharp videos with faithful colors. These cameras have more advanced automatic tracking of subjects and stabilization techniques. Sony cameras have OLED displays, which looks tremendous. The microphone can handle Dolby surround sound recordings. These are lightweight and compact siblings of the gigantic professional versions. Most of these type of camcorders have several visual effects like background defocus feature and manual camera controls to overpower shutter speed, aperture and white balance. Camcorders: Panasonic HC-VX985, Panasonic HC-WXF995, Sony FDR-AX100, Sony FDR-AX40, Sony FDR-AX700, Canon Vixia GX10. If you need professional quality videos for broadcasting, you need some good professional production quality handheld camcorders. With this you can shoot scenes exactly the way you see it with detailed image adjustment functions such as color correction, skin tone detail, hue adjustment, gain assist and auto exposure. It gives you the total creative control and freedom than a normal camcorder. Most of these cameras come with interchangeable lens mount system that offers you the added flexibility of using a range of interchangeable video lenses for more creative expression. These cameras have exceptional exposure control and in-built Neutral Density filters for added image control when shooting under bright conditions. The advanced Optical Image Stabilizer comes with these cameras use gyroscopic sensors to detect even the slightest camera shake, which is then automatically compensated for using a Vari-Angle Prism. You can expect more features such as marker display, focus assist options, zebra pattern and color bars on these cameras. Professional camcorders use better image processor with a 3-CMOS sensor system that delivers optimal image quality, at 50 Mbps or higher capacity data recording. 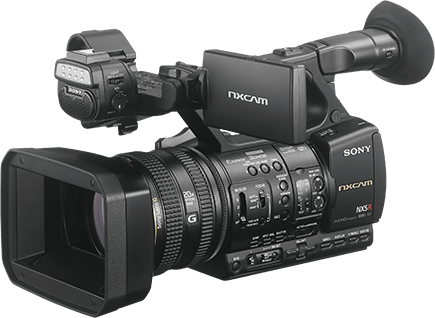 Camcorders: Canon XA30, XA35, XF105, XF205, XF305, Sony HXR-NX range, Sony FDR-AX1, Sony NEX-FS700RH, Sony HXR-NX5R, Panasonic AG-HPX255, Canon Professional XF400, Panasonic HDC-Z10000EZ. These are new gen cameras we want to introduce to you. You may be heard about GoPro cameras. These are advanced action camera perfect for shooting sports that you can playback on your TV or can upload to Youtube. It can capture shots with better audio with noise reduction, even in wind. It also has some video stabilization mechanism and importantly it is waterproof, for water-based and off-road adventures. If you want to shoot 360-degree video, there are some small action cameras are available in the market that can shoot in 4K resolution like Nikon KeyMission 360. It’s waterproof and shockproof camera and you can play your footage on a Virtual Reality headset, online or through an app. The decision is yours, considering your budget and purpose, you can select the best camcorder from the market. If you need it for family vacations or capturing family events a basic rig is sufficient. I have all the basic ingredients for your need and have better connectivity. If you need a more advanced camera you can select one based on your budget. Looking for some action cameras or for some all-weather cameras, there is a growing list of action cameras available on the market. You may get an earlier model at half the price of a new one. Which camcorder are you using now?